The awards, if not the NFL job offers, continue to pile up for Colin Kaepernick. Barely two weeks after GQ Magazine named the former San Francisco quarterback its “Citizen of the Year,” Kaepernick, who sparked league-wide protests against social injustice when he began kneeling for the national anthem last year, also was tabbed on Thursday as the recipient of the 2017 Sports Illustrated Muhammad Ali Legacy Award. “I am proud to be able to present this to Colin for his passionate defense of social justice and civil rights for all people,” Lonnie Ali, Muhammad’s widow, told SI. “Like Muhammad, Colin is a man who stands on his convictions with confidence and courage, undaunted by the personal sacrifices he has had to make to have his message heard. Previous winners of the award – which is given to sports figures who, like Ali, “embody the ideals of sportsmanship, leadership and philanthropy and has used sports as a platform for changing the world” -- have included Bill Russell, Jim Brown, Kareem Abdul-Jabbar, Jack Nicklaus and Magic Johnson. Kaepernick, 30, began kneeling during the anthem during the 2016 preseason to protest police brutality and to draw attention to other social injustices. His protests since have been followed by other players in the NFL and elsewhere, drawing criticism from President Donald Trump and others who charge the demonstrations are disrespectful to the military and the American flag. 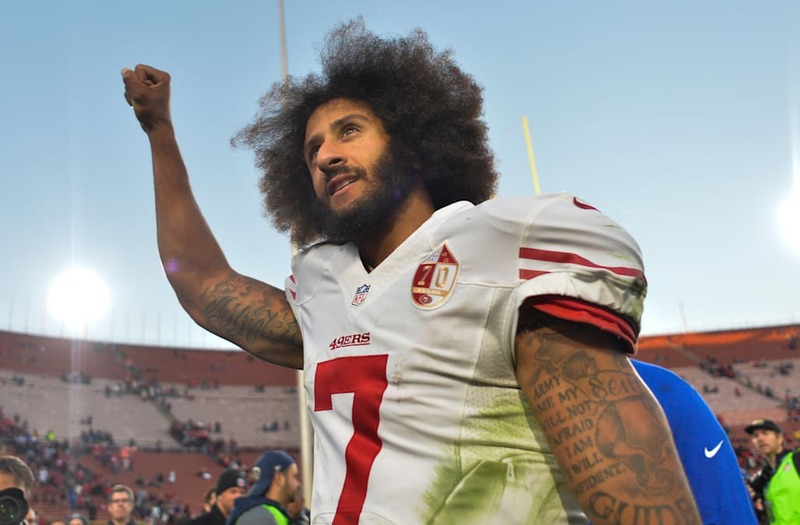 Kaepernick, who also personally pledged to donate $1 million to charitable organizations working in oppressed communities, opted out of his contract with the 49ers in March but he still hasn’t been signed by another NFL team for this season. In October, he filed a grievance against the NFL, alleging collusion by the owners to blackball him from the league. Kaepernick is expected to attend SI’s Sportsperson of the Year Awards show on Tuesday in New York to receive the Legacy Award, which is given in honor of Ali, who died in June of 2016.